Hillcrest’s Energy Advice Team (HEAT), which aims to reduce fuel poverty and keep tenants warm over winter were delighted to scoop a top industry award. HEAT were nominated for the Margaret Blackwood Excellence in Housing Innovation Award in recognition of the support they offer tenants who are struggling to pay bills, or have been cut off from their supply. 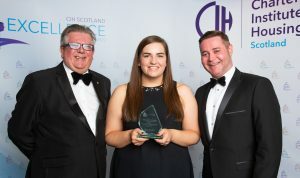 The Chartered Institute of Housing Excellence Awards, which were held this year at Edinburgh International Conference Centre on Friday 2nd of November, celebrates the cream of the crop in Scotland’s housing sector. Based in Dundee but covering Hillcrest’s full spread of properties from Aberdeen to Edinburgh, HEAT has helped Hillcrest tenants with a range of energy efficiency aspects since their inception in 2013. These include using heating systems efficiently, switching to cheaper energy suppliers, obtaining Warm Home Discounts and Winter Fuel Allowances, minimising damp and condensation, and offering tips and advice on saving energy. Throughout 2017/18, HEAT has also been offering an emergency token scheme that provides those in critical need with energy tokens of up to £50. This emergency electricity and gas credit restores power to tenants who have been cut off from their supply. This has been particularly useful with the introduction of Universal Credit, which has seen some tenants wait up to six weeks for their payment. Bob Sander, Hillcrest Director of Housing, said: “The team’s innovative approach to addressing a serious issue is one to be commended. In regards the £50 energy token scheme, although there was no money available to provide this service, the team did not let this put them off and instead successfully secured external funding from Energy Action Scotland. If you would like to find out how you can reduce your fuel bills or are struggling to heat your Hillcrest home, get in touch with us here and we can arrange a visit from one of the Energy Advice Team.